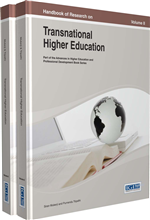 This chapter looks at a practical example of staff development and considers how professional development of teachers should be an essential component of enhancing provision within higher educational institutions not just in terms of pedagogy but also in respect of developing programmes and marketing those programmes. Set within the specific context of English Language teaching for international students, the research is based on a case study of two trainee teachers on a DELTA programme (Diploma in English Language Teaching for Adults). These teachers have been interviewed at two different stages of their development, firstly whilst doing the DELTA course, and then one year later, by which time they have completed the course. Through analysing their responses in a qualitative fashion, the author examines whether teacher development has a positive impact on the higher educational institution as a whole, and whether it leads to an improved student experience or a heightened consciousness of that student experience on the part of teachers. At the heart of this chapter, there is a metaphor taken from Medical Science to define the best approach to teacher education and development, namely, what the author labels an intramuscular approach. The author takes this term from a medical process of giving injections that are placed deep within muscles so that the particular drug or medicine is released slowly over a period of time rather than in a standard one-shot manner. There is no quick fix solution to teacher development, and having a long-term vision contributes far more to organisations in terms of the ultimate student experience. In the medical world, there are two different common forms of injection; subcutaneous and intramuscular, with the latter being one that is “given directly into the central area of a specific muscle” (www.lexic.us). This means that the fluid substance of the injection is released over time rather than immediately as a one-shot solution. As such, it is a form of treatment particularly suited to patients getting some form of long-term treatment such as gene therapy or hormone replacement. The medicine, within the muscle, is released over a period of months rather than in a single dose, meaning that it offers long rather than short term forms of treatment. In the medical literature, numerous papers have described ways in which this form of treatment has been used in the battle against particular ailments. However, it also serves as a useful analogy for the best practices of contemporary teacher education. Long-term approaches to development have taken on greater significance because of the increasing emphasis upon the student experience, particularly in the context of United Kingdom higher education. If students are to have a good experience, they need good and experienced teachers who understand their individual needs and how to address those needs. Insider Research: Research conducted within an organisation that the researcher works for, or is closely involved with. DELTA: Internationally recognised English Language teaching diploma equivalent to a Masters degree and& regulated by Cambridge ESOL. Teacher Development/Teacher Education: Terms often used interchangeably to describe the process of continuous professional development undertaken by teachers. Intramuscular: A form of medical treatment, normally by injection, which is administered over a period of time rather than in a single one-shot solution. Teacher Training: Term generally used to describe the courses and qualifications that teachers undertake and receive at the outset of their careers, or one-off courses that are largely designed with a short-term or immediate purpose in mind. Teacher Cognition: A theoretical construct which has emerged in recent decades to describe the complexity of teachers’ ‘mental lives’ (Borg, 2006). Marketing in English Language Teaching: The promotion of courses and organisations which provide studies in various fields of English Language teaching. English for Academic Purposes: Preparation for students in the linguistic and practical approaches required to begin or complete academic studies in the context of second language education; usually at a further or higher level. Student Experience: Umbrella term for the feelings and perception of students with regard to their educational experience, generally within higher education.